Careful and consistent use of language is a vital element of diplomacy. The terms that policymakers use to define regions are often sensitive. One example of such terminology is the term ‘Indo-Pacific’, which has been adopted over the past several years by a number of governments, including Australia’s, to describe what was previously known as the ‘Asia-Pacific’ region. Australia’s use of this term is problematic and should be reconsidered. Australia’s 2017 Foreign Policy White Paper states that use of the term Indo-Pacific refers to a geographical region “ranging from the eastern Indian Ocean to the Pacific Ocean connected by Southeast Asia, including India, North Asia and the United States”. While the Department of Foreign Affairs and Trade (DFAT) defines North Asia to include China, the expression Indo-Pacific aims to raise the importance of India in the region, at the expense of India’s strategic competitor, the People’s Republic of China (PRC). 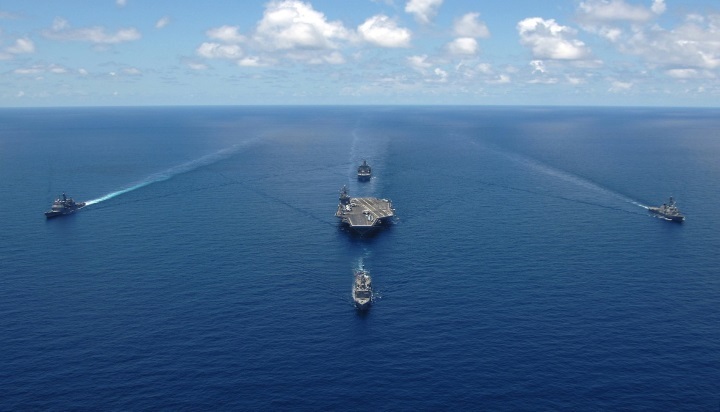 Although DFAT may define Indo-Pacific as a geographical term, it is clear that the term is a tool to frame the geopolitical intent of Australia, as well as the United States and its other allies, to push back against the PRC’s rise. Over the past five years at least, the Australian Government and DFAT have used Indo-Pacific in policy pronouncements, speeches and public documents. In Washington too a shift in language has been evident; former US President Barack Obama preferred to use Asia-Pacific (although his Vice-President Joe Biden and Secretary of State Hillary Clinton often used Indo-Pacific). President Donald Trump now refers to the region as the Indo-Pacific. It is a term that sits hand in hand with an increasing emphasis on security in policy thinking towards the PRC. For example, it is often used when Australia calls for greater US presence in the region as well as in conjunction with attempts to develop a Quadrilateral Security Dialogue among the US, Japan, Australia and India – an ideologically defined grouping intended to provide a counterweight to the PRC. The United States Pacific Command was recently renamed the United States Indo-Pacific Command, a move targeted against the PRC’s actions in the South China Sea. Furthermore, the recent propagation of the Quad’s strategic plan a ‘Free and Open Indo-Pacific’, provides the region with alternatives to the PRC’s Belt and Road Initiative (BRI). Obviously Australia should be aware of security challenges posed by Beijing. However, use of the term Indo-Pacific is counter-productive to Australia’s national interests, which include development of long-term friendly and economically beneficial relations with the PRC, the country with which Australia is most economically integrated of all the G20 nations. Put simply, the PRC dislikes the term Indo-Pacific. The use of Indo-Pacific has implications for how countries approach security competition and cooperation in the region and how they manage the rise of the PRC. Use of the term seems to be part of a strategy to downgrade the PRC’s importance and influence, feeding into the established ‘hawkish’ narrative on how countries should respond to the PRC’s rise. The irony is that the PRC has developed a ‘Two-Ocean Strategy’ for over a decade, along with the BRI, which aims to link the two regions together on its own terms. The most important Australian foreign policy question of a generation is how best to balance relations between the PRC and the US. As long as Canberra continues to see the world solely through a US alliance-driven ideological lens, it will get in the way of a more balanced, rational and national interest-driven policymaking toward the PRC. Despite the obvious value of the US alliance to Australia, there will be issues on which our perspectives differ and this is one of them. For the past 40 years, Australia has sought to work with the region to define an Asia-Pacific that is focused on economic cooperation. Australia was a key architect of the Asia-Pacific Economic Cooperation (APEC) forum, a grouping of 21 Pacific Rim nations, including Australia, the PRC, Japan and the US. The use of the term Indo-Pacific – including at APEC – turns the region into a geopolitical battleground. Australia needs to take the lead to build and sustain Asian architecture, and work closely with the Association of Southeast Asian Nations, Japan, South Korea, India – and the PRC. Although Australian strategic thinkers had a prominent role in the formation and proliferation of the term Indo-Pacific, we should not be a ‘deputy sheriff’ to the US again, as we were during the Vietnam War. Continued use of the term Indo-Pacific as it is defined today is not a constructive step towards a realisation of the goal of constructive relations with the PRC. The term should be abandoned and we should revert back to Asia-Pacific. Clarity is required on how any important term best suits Australia’s national interests and shared interests with our Asian neighbours. Our region should be one of cooperation rather than competition, and our use of language should reflect that. Ciara Morris is a recent graduate of the University of Sydney with a Bachelor of Arts (Honours) in Government and International Relations and Chinese Studies. Ciara is currently national executive director of publications for the Australia-China Youth Association and an intern at the Australian Institute of International Affairs.